This is going to be a semi-crazy and very fun week for me. I’m heading out for a week filled with book signings. I’ll be beginning tonight in my hometown of Huntsville, Alabama, and then going to Oxford, Jackson, and Memphis. Click here for more information about where I’ll be traveling over the next few weeks. I’d love to meet you! *A lot of stores are selling out of our book.If you are planning on attending a book signing, you might want to go ahead and visit that store to pick up your copy of the book to ensure they have enough. You can also help ensure they have enough by clicking on the city names above of the ones you plan on attending to RSVP on FB. My AMAZING Mother in Law has come to stay and take my place this week so the kids will be well taken care of but I’ve been trying to teach Ricky how to make a few slow cooker meals so supper won’t be a hassle for any of them. Let me tell you a little about my husband – he is an Engineer. He is one of the most intelligent people I know, can design entire space stations and such on his own, but when it comes to cooking his intelligence kinda gets in the way a bit. 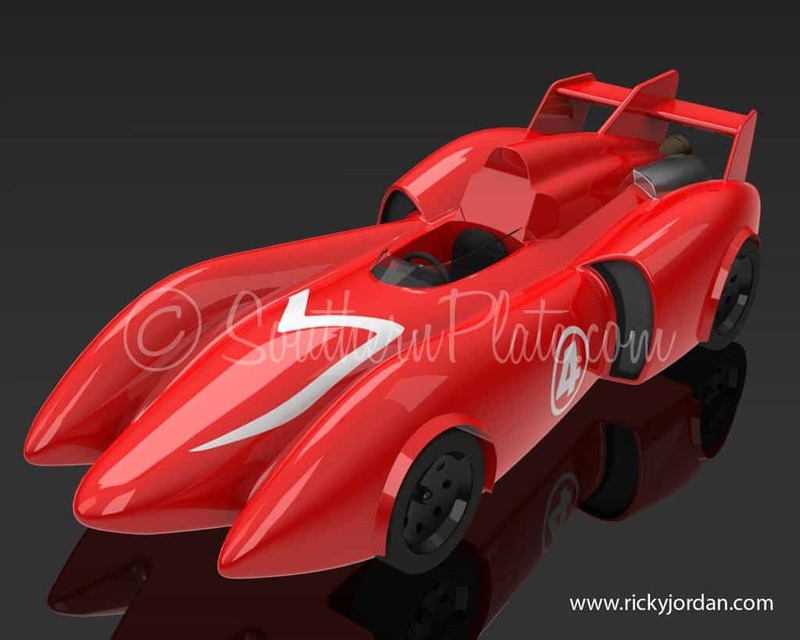 Just to show you how smart he is, below is something he designed from start to finish in CAD program called SolidWorks (we are sooooooo a SolidWorks Family. Even my eleven year old has been learning the software). See? Takes a smart fella to make that. Can he cook supper though? We’ll be finding out this week! His past cooking ventures have been kind of interesting. The perfect example of this is shortly after we were married. He said he was going to cook a special dish for me, a recipe he made up in college called “Beef Rice”. Beef Rice consists of beef flavored Rice-A-Roni and cooked ground beef stirred together. Now, don’t get me wrong, we still eat Beef Rice to this day, but it was how he went about cooking it that made me realize I was destined to be the cook in this family. Apparently, he had always cooked the beef first and then washed and dried that pan before getting out a pot for the rice and cooking it next. Well, on this fateful day he had a brilliant idea! What if he cooked the Beef in the skillet AND the rice in a pot AT THE SAME TIME!? I had to wonder if he thought we started cooking our suppers first thing in the morning in order to have all of it done by dinner time but didn’t say anything. Instead, I congratulated him on his new found skill, went into the bedroom, and called Mama to tell her. We still get a giggle out of that today. So in my attempt to expand Ricky’s cooking repertoire beyond PB&J and Beef Rice, here are some slow cooker recipes I’ve been trying to teach him. Ricky has been having cow fits over this stuff lately and has assured me he WILL be making it this week. Ever make a pot roast and have it turn out dry? Dry roasts will be forever behind you now! 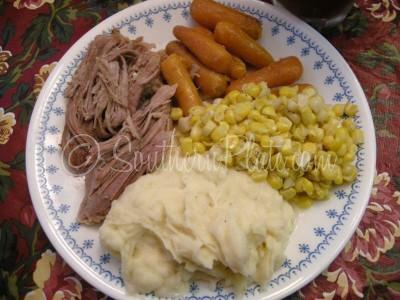 This is a great way to cook a roast and get two nights worth of suppers out of it! I can get ANYTHING I want just by offering to make this for my husband! This post includes the entire menu pictured. 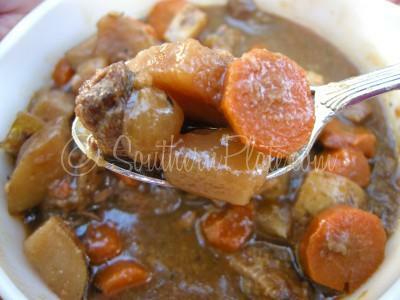 I just love a good and hearty stew! 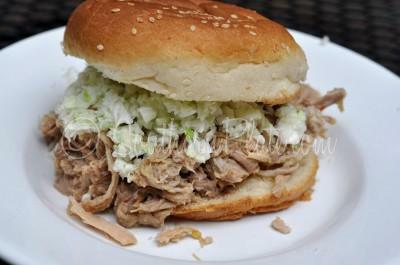 This is the type of BBQ we have in North Alabama with a tender and flavorful pork and a nice clear sauce to pour over it. YUM! Valerie, thank you so much for today’s quote! I just love it!!! He’s gonna do just fine. Enjoy your book signings this week. I’ll be praying for you and your family. God has truly blessed a wonderful woman and her family. Thank you so much for sharing such wonderful recipes. One thing I did for my kids when I was gone for a whole weekend was leave them little treats to find. One day it was just a candy bar. The next day a letter or card from mommy and on the last day they discovered a new movie. They had so much fun trying to figure out what they were going to find the next day. Give em lots of hugs and kisses! Have fun this week Christy! Thank YOU so much, Beth! These ideas are perfect. I think I have just enough time to pull it together! I sure do appreciate your help! Aren’t the Mud Hens the best thing? I need some of those so bad and am SO glad you tried them (and liked them!). Thank you so much for being part of the family! hehe SolidWorks family, too! We’re gonna be eating on that pulled pork BBQ all week, I think 🙂 Sooooo yummy. Oh thank you!!! hope you have a great week! The pulled pork is really good in tacos, too with some salsa and other typical toppings. I also use it to make simple mu shoo pork-I get soft flour tortillas, hoisin sauce, green onions and slaw mix. I lightly sautee the slaw mix with some ginger, garlic and soy- steam maybe 5-10 mins. Spread some hoisin on the tortilla, add some pork, some green onion, and the slaw mix. Yummy! Christy, I found Southern Plate through a link on Ricky’s site for your fried donuts. I’m an engineer using SW and think it is so cool you’ve got your son learning it already! 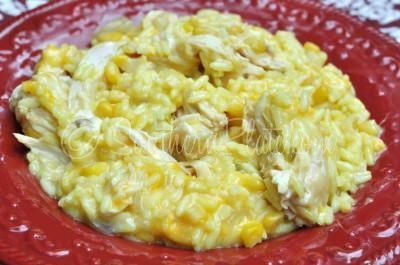 I made the Cheesy Chicken and Rice recently to rave reviews – it was declared The Best Ever. 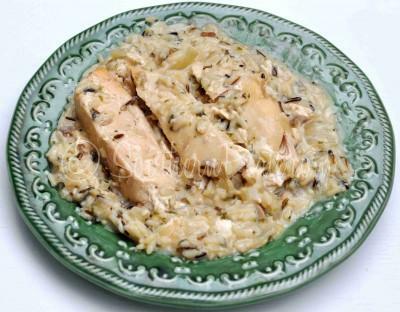 Next up this week is the Chicken with Wild Rice. Congratulations on the cookbook and all your well earned successes of late. I wish you even more. Thank you so much Elizabeth!! Brady really enjoys SW. When he was little Ricky used to model his favorite cartoon characters and such in it and then we got the kids version but quickly just moved him right on up to the real thing. Maybe we’ll have an engineer here in the next few years! (he is eleven now). Its amazing what they can learn that you just don’t think about teaching sometimes! I’m so glad you liked those recipes! The wild rice one is the one that Ricky will actually come home early for! hehe. Gotta love our smart guys!! I just got your cookbook in the mail, so I am excited to try not only the slow-cooker recipes, but so many more! I hope your book signings are wonderful. Thank you Michelle! I’m really excited about them! Maybe if you wrote out the recipes like this – http://www.ahajokes.com/foo012.html – Ricky might do better. Good luck with the book tour, I’m getting my copy today. Oh yeah – SolidWorks is spelled with a capital letter W in the middle. Jes sayin…. I love this post! I have 2 sons and 1 is a wonderful cook but the other one needs some work. He does well if you like mac and cheese and pork and beans every day. Congrats on your success. I am so proud for you! Thank you so much Jenny!!! Sounds like you got great kids either way! I made the cheesy chicken and rice last week and my husband LOVES it. Just wanted to say thanks for the GREAT tasting and EASY to prepare recipe! I totally get the cooking one thing at a time – it stems from cooking on a hot plate! Had not thought of that! lol !!! how funny! Much success and enjoy your book signings. I feel sure all will be under control at home so relax and have fun. Slow cookers are great and I still use my original crock pot circa 1972. Thank you so much Elaine! You’ve been an inspiration to me for a very long time now and I hope you know how much I appreciate you! 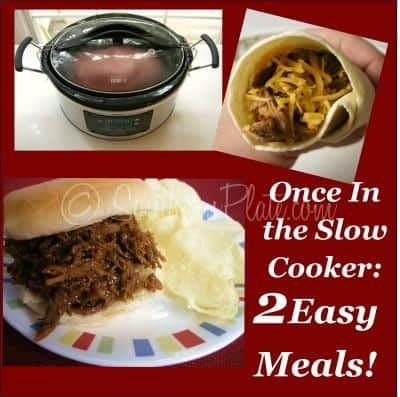 this is perfect since i have a brand new slow cooker and have no idea what to do with it! I LOVE my slow cooker! What kind did you get? I’ve tried the chicken w/wild rice and the beef stew – both yummy! Have fun on your book tour. Us Moms worry about about our children and husband when we are gone, but it’s good for them and they will be fine! 🙂 They usually do better than we do! Thank you so much Alana! Sounds like you like our favorites, too! If you don’t mind sharing! I just wanted to note that I got your cookbook from Amazon the day it was released. I collect cookbooks and it will be in my top five favorites I have. I love the recipes and the fact they are easy to make and sound very good. Some of them (even though I am a Northern Lady) I have cooked in a similar way and even my Mom (Bless her soul) cook some great things. Thanks for collecting such great recipes and putting them in a book. Now Nancy, I LOVE Northern folks! I was just telling a group in Nashville yesterday that we gotta be extra nice to Northerners because y’all got some good recipes, too!!! Thank YOU for all of your support and being part of the fam! My husband is an engineer too and his cooking skills are limited to grilling out hamburgers! He actually has done a pretty good job with bran muffins and microwave peanut brittle and he and our daughter like to do fudge at christmas time. I hope you have a good week signing all those books and giving out hugs(which you do so well). TRY not to worry about home. I know you are glad to have the mama-in-law there. Be safe and I hope to get to see you before too long. I can’t tell you what a relief it is to at least have their grandmother here in my absence. That gives me a lot of peace knowing it. Looks like I’m gonna be super busy and the good news is I get to meet a lot of folks so I’m hoping to be back home before I know it! have a safe and enjoyable trip!!! He will manage just fine. I ordered another cookbook just now. I took mine to work Thursday, got it back today and someone else took it home to look through. Another gal wants to look at it when this one brings it back. hopefully, some of them will need a copy. Christy, This is the first time writing to you. I purchased your cookbook today at Books a Million, at first i couldn’t find it, i kept looking thru the cookbooks and was just about to leave when low and behold i saw it sticking out between two other cookbook. I felt like i had won the lottery. I have cooked quite a few of your recipes. Two of your cakes, Honey bun cake and the coca cola cake went with me to our college game tail gate parties. I first tried them out on my hubby to see if he thought they were good enough to take to the game. He gaves you 10 Stars. So i knew they were winners. We have another game in about 2 weeks. I am thinking about your Apple Dapple cake. My hubby is complaining tho, he says there is never any cake left after the games to bring home. You gotta love him. I hope you have a wonderful trip and don’t worry about the family, i am sure your MIL will take good care of them. Christy thanks so much for taking care of all of our families as well as your own! 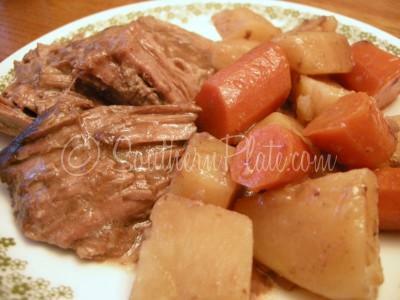 My crockpot roast has been suffering “dryness” lately and you just provided me with the fix! Thanks I love reading all of your stories and recipes and can’t wait to try more of them out. Caramel corn is going to be the dessert of the week & a nice little gift for my 2 yr old twins’ pre-school teachers. I live in the Memphis Area but can’t make it to the book signing…I hope it goes well! Christy, got your book today and adore it. Your writing shows how very much you love your family. Good luck on your tour. Shame you aren’t coming to Maryland. Lots of southerners here as well. Just a short story about my grandma who was basically a good cook but could not make spaghetti. She browned her ground beef (with bacon grease mind you) until it was crispy and even then didn’t drain it! She just mixed it with jarred sauce and dumped it on mushy noodles. But no one ever told her that uit was bad. We didn’t have the heart. She just said that no one in the hills of West Virginia ever made it so she figured it out on her own. Oh well, gotta love it. She’s gone now but I have the memories. Just found your website and H.E.A.R.T. it!! I have 5 children (1 girl and 4 boys) and these recipes are great! I was looking at your tour schedule and you are going to be in B’ham on Nov. 4th and I would love to come but our daughter is having major surgery that day in B’ham. Hope all goes well! I love that story about Ricky’s Beef Rice. My husband is pretty good in the kitchen, but I can’t count the number of times I’ve had to bite my tongue and laugh secretly at how he does things. Most of what he cooks turns out good, but so many times it’s just not how I would do it! i,too,have a husband who’s intelligence gets in the way.i call him left brain!! but his heart for me is always in the right place!! i am sure your ricky is the same. the difference is mine is a yankee. but all is forgiven for that!! just received your book today . not many stores in the chicago area are carrying it.the book is wonderful!! i explained to my husband how you started and the book deal. the southern living article. and then i started reading to him from the book your stories. we both we crying. he said he was so glad i ordered the book. and so am i.
the story of your grandfather reminds me of my own. and it reminds me also of my late uncle who recently passed.one of his children told me at his funeral how i was his favorite. enjoy this time. only wish you were coming to chicago!! As always you give me more receipes to try! still going through her cookbooks. But Christy reminds me so much of her, Her passion for her family and sharing her life and great receipes. There’s nothing better than southern platte! I just love your site and the recipes. I feel like I am sitting around the kitchen table with old friends. Keep up the good work and good luck with your book. Christy, So sorry I missed you in Huntsville yesterday but didn’t know you were here. Dale and I love your cookbook and want to get it signed. I’m reading it from front to back and loving every minute of it. Shocked to turn a page and there’s “ANALOYCE’s …….WOW that’s special!! Thanks and my best to your family. I’m PROUD. I have made both of the chicken recipes. Both were delicious, but with the Cheesy chicken one, I added a can of diced green chiles. My husband like his food spicy and it give it a small kick and was awesome. Thanks for all your great recipes! Christy, that’s the best quote I’ve seen in a long long time. I’ve considered tracking back to planting the wheat – to make the bread – to shread into bread crumbs, but to be fair, we really should start at the beginning.